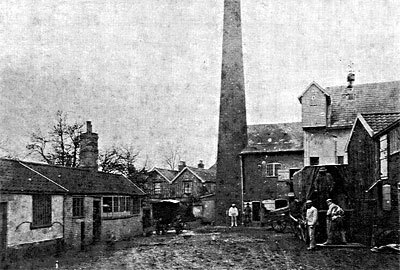 Dickleburgh had an early postmill that stood near Burston Wood and in 1834, it became the first mill in Norfolk to use auxiliary steam power when an 18hp beam engine was installed. 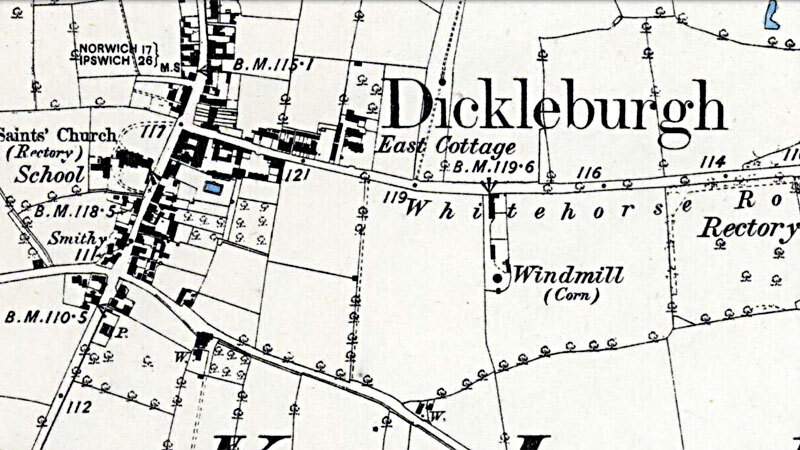 When the windmill ceased working the incumbent firm of William Smith & Son continued working from a new site in the centre of Dickleburgh using steam and then oil in later years. Two engines were in use but it's not know if they were steam or more likely, oil. ... mill stood in field near the Burston wood ... came into possession of Mr. William Smith in 1780. In 1834 a beam steam engine was installed of 18 horse power, the first of its kind in Norfolk. Dickleburgh. 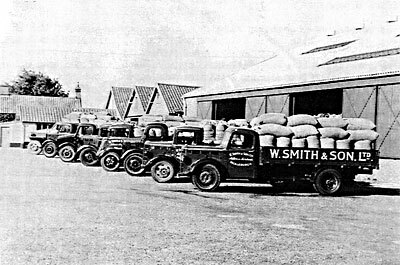 Firm of W. Smith & Son founded 1780. Had first steam mill in Norfolk. A bit of a side issue, but it is just possible that the oldest picture - actually a photograph of an oil painting long gone from the family – was painted by George Cattermole, later a well known illustrator, including of Dickens’ work. George Cattermole was the son of squire Cattermole of Dickleburgh, presumably a friend of William Smith senior and executor of his will (but I have absolutely no proof of this, merely a circumstantial document and a mind which makes connections). I can’t think why else a rural publican would have an oil painting done of himself, unless there was somebody very close to him who could paint!! 1. 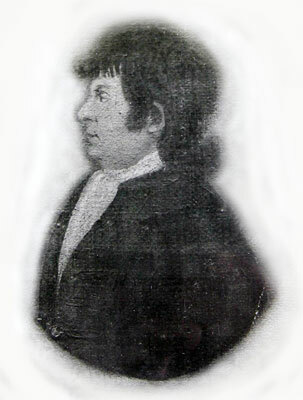 The first William Smith connected with the Mill, died 1812 aged 64. I believe (though I have not researched it) that this man, (also a publican - the White Horse now gone?) first bought the milling business. 2. 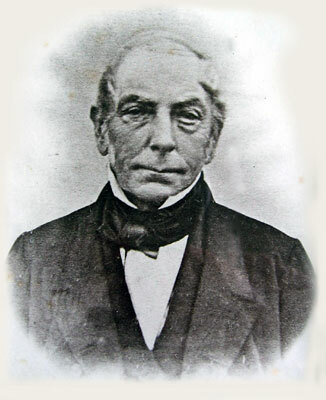 William Smith, son of above, died 1862. 4. William Rayson Smith son/grandson/great grandson of above. Died in 1932. 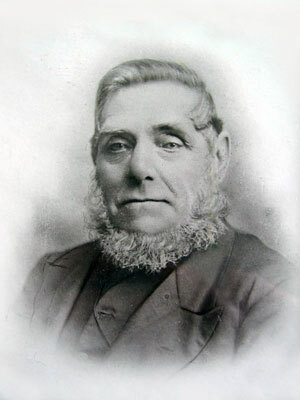 This man was married into the Hudson family (Maria Hudson), who had a rolling mill in Harleston. No children. 5. 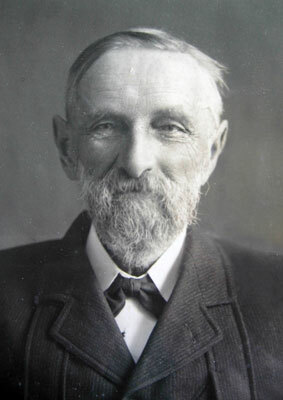 Sam Smith who ran the business in later years. 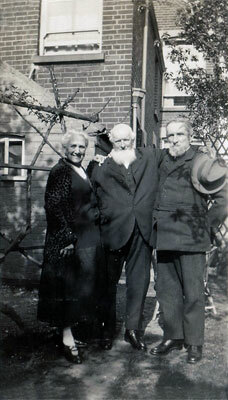 The second photo (in old age) is taken with his sister Emma Smith Womack, my great grandmother and his older brother William Rayson Smith. 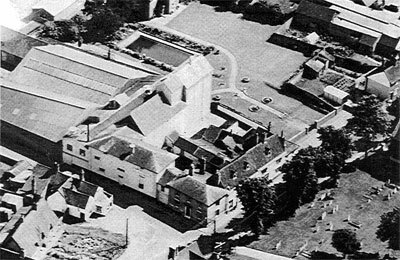 Aerial view c.1960 before Dickleburgh Street was widened and the houses demolished. The span of factory-style roofing covers the original yard. Looking into the original yard, with wagons and barrow bridge. Looking west, showing chimney for steam power, engine house and other buildings before 1922. Looking north, showing lorry fleet and buildings on east side of site. Looking southeast over former yard for offices. North and west elevations of original buildings, looking southeast. Note the infilled, arched doorway which led originally to the yard. On June 4, 1960, the Eastern Daily Press carried an advertising feature on the mill, which mentioned that the firm had spaces for twenty wagons at Burston station, which served as the nearest rail loading point. During its later years, the mill buildings were used more for storage than for production. 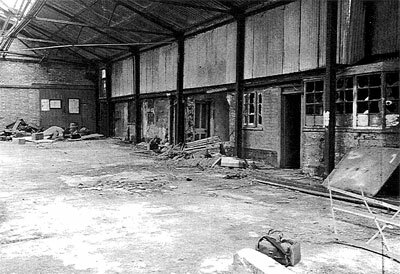 The mill premises finally closed in 1990. From 1836, when Smith was listed in White as a corn and seed merchant and his son as a corn miller, the business expanded to include marketing seeds and coal and, by 1937, manufacturing poultry food. By 1922 the business had a managing director, Mr. A. Dent. 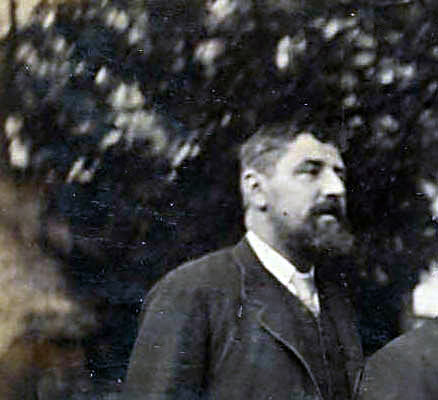 The Smith family were listed as farmers also by 1892. Obviously the business prospered and diversified until its decline in recent years. The building at the junction of the main street with Rushall Road is of mixed brick and clay lump construction. Orientated mainly N-S, the building is L-shaped, with the foot of the L forming an extension to the west. The lower part of the walls, varying from between c.4ft to c.10ft in height is of brick and the corners are of brick also. Above this and infilling the external surfaces is typical Norfolk clay lump which can be seen through the surface rendering. On the west elevation, the top level is of brick, as is the gable end (visible at the south end). The wall of the western extension is thicker at ground level than for the rest of the building. The north elevation is of similar build but no evidence of brick was found in the top section. Halfway along this elevation there is an in-filled gateway into the former yard of the mill, the arched opening being well-defined in a remaining brick outline. The top floor windows on this side once had opening lights which were iron- framed; remains of these were found inside the building. The east side of the building has been much altered as the result of the roofing over of the original yard in 1938-9 and the erection of a mixing and cubing platform against it. This led to cutting of openings in the walls. There are sections of clay lump visible in places among patchings of brick. Within the building there are more brick walls visible than from the out-side, which seems to show that parts of the walls may have been brick-lined inside. This is particularly noticeable on the west end of the extension. Internal partition walls, where still existing, are also mostly of brick. Floors are of wood with wood beams. Many roof timbers appear to be early, perhaps from the original nineteenth century building. The increased use of brick as the business increased may not only have been due to changing fashion from clay lump but also to the need to strengthen the structures for heavier loading by machinery and stock. The roof cladding has been replaced with corrugated asbestos cement sheets over the whole building. At the south end of the roof an additional structure has been erected on top, consisting of wood framed with asbestos cement cladding, housing an extractor unit. This is a second remaining older building, forming part of the southern boundary of the site. It is single storey, orientated E-W, and was originally on the south side of the yard before it was roofed over. This building again is of mixed fabric, some bays being of brick and others of clay lump: clay lump occurs mostly at the eastern end of the range. 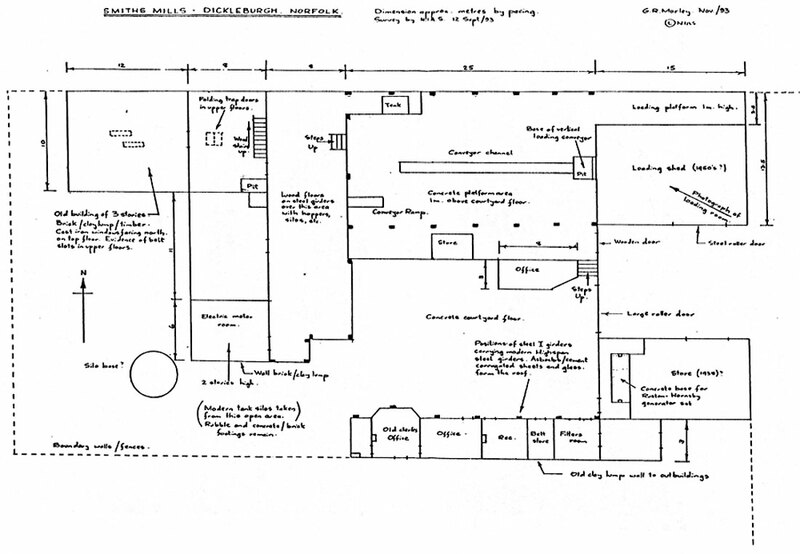 A large bay window shows which was the former owner's office, giving him a supervisory overview of the whole yard. This also appears to have been of early construction. It adjoins the east end of the office building. It has been completely rebuilt over the years, but traces of its original fabric remain. The engine bases are still visible within the present building, showing that there were once two engines, mounted side by side on a N-S orientation. On the north side of the site, adjacent to the building described above, is a frontage of a building that filled in the original front entrance to the mill. There is no building behind this frontage now, and it has been replaced by a structure for mixing and cubing. The remaining facade has a large sliding door at ground level, with brickwork above it. The facade is strengthened by a steel frame of flat bars. The remaining buildings are understood to have been added in stages since 1938. To the east of the original mill building the whole former yard area and the north side of the site is covered by a large structure of a double bay roof of corrugated asbestos sheeting supported by RSJ columns and trusses of steel angle iron, typical of such roofs in the 1930s. The north wall of this area is of brick. The northern half is occupied by a raised platform which served as a bagging and loading area for the mill products. Channels within this raised platform once held conveyors for moving sacks. At the west end is a structure again supported by RSJs which held the mixing and cubing plant. This structure is at two levels and abuts the east wall of the original buildings, the lower part being level with the original yard surface, and the upper part level with the first floor of the mill. Two were dated 1955 and 1958, the date being shown under 'Dickleburgh'. The third bore no date. 013083. (The gauge was also marked with the name King's Lynn Scales - presumably the suppliers). 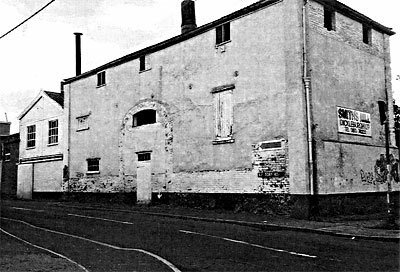 The steam mill complex was at the corner of the junction between Whitehorse Road (later to become Rectory Road) and the road running north-south. 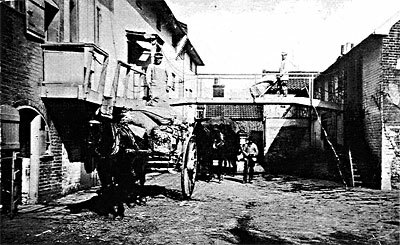 The Whitehorse_Road_windmill shown as Windmill (Corn) was not under the same ownership as the steam mill.